The Alpine Action minibus service is at the beginning and the end of the day from outside your chalet to the main lift area and your lessons. Please note: There is no evening minibus service, and the minibuses are not available on transfer days Sunday for Season 2019/2019. You will be able to text your driver from your location in Meribel at the end of your days skiing for a lift back to your chalet. The "free" resort bus runs pass all our chalets throughout the day, should you need to get back to the chalet during the day. During high season Christmas, New Year and Half terms, the Alpine Action minibus service will be increased to assist those with children. "Access to the slopes via Elliott and his trusty minibus. Only five minutes away. Just give him a call and he will pick you up from anywhere in the resort as soon as he can.. To be fair can't fault a thing." "Nothing was too much trouble for our minibus drivers Rory, Elliott and Ollie who were happy to lug our gear on and off the cans and would only have to wait a few minutes for pick ups." 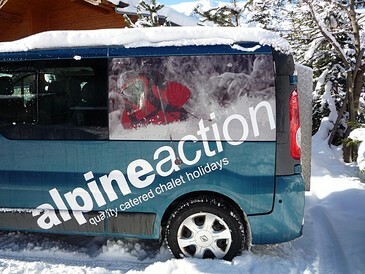 "The chalet was a little way from the slopes so the minibus was a great help. The drivers were again really friendly and even helped carry our skis and poles to the bus. Not only that they were more than happy to pick us up after a few drinks at the bar towards the top of the resort"
"The minibus service was a really nice touch and our driver Rory was so helpful even picking us up with the buggy when we'd taken the girls our for a walk"